Rich soil. Fields, woods, gardens. This is the largest of the puffball species, reaching up to 20″ or more across. No other puffballs in Minnesota exceed 4″ in diameter at maturity. It is one of the “Foolproof Four”, the four most easily identified mushrooms. It is edible when young and solid inside. Found with our daycare kids on a nature walk! found in outskirts of wooded area. This particular puff ball mushroom was the size of a soccer ball! The Giant Puffball ("Calvatia gigantea") & it's smaller relatives are good mushrooms for beginners to try as they have no gills and are white inside. Their taste is rather bland so they take on the flavors of whatever they're cooked with. 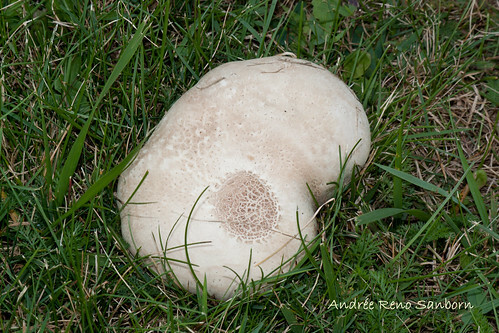 DON"T EAT ANY MUSHROOM UNLESS YOU ARE 100% SURE OF ITS IDENTITY! Thanks to "burtontube" who pointed out to me that I should have said that puffball powder is a COAGULANT not an anticoagulant.I stand corrected. Giant puffball mushroom found in Oregon (Calvatia gigantica) This is edible when it is white. Used for making ink in Tibet. This edible fungus is the size of a beach ball. http://www.youtube.com/user/Earthwalker40 then check out http://www.blogger.com/profile/16589694922742883622 I found this wild giant puffball mushroom/Calvatia gigantea while fall wild mushroom hunting in a hardwood forest in Ohio on 9/12/12. How to find. It was around the time Ed and Amy Delaney were celebrating an anniversary that Mr Delaney found a giant mushroom in their backyard. So instead of the traditional bouquet of flowers, he decided to surprise his wife with the fungus. Wife Amy came downstairs and was taken aback by the mushroom the size of two basketballs. 'I walked in and his arms were literally filled with this huge, disgusting white mass,' Mrs Delaney told WILX. But that's not all. Mrs Delaney found an even bigger mushroom in their yard a few days later. In total, the family spotted four giant mushrooms in their backyard. An expert at Michigan State University identified the mushrooms as Calvatia Gigantea, commonly known as giant puffball mushrooms. Jonathan Walton an MSU professor of plant biology, says he's never seen a specimen this big. Unfortunately for the Delaneys, the mushrooms aren't worth anything and Professor Walton doesn't advise eating them. Giant puffball mushrooms look like giant rounds of fresh mozzarella, but they grow to about a foot in diameter. Some can grow as large as five feet in diameter and weigh as much as 44 pounds. When the Delaney's daughter Madison Gomez had two of her friends over Friday, she told them about the mushrooms but they wouldn't believe her. 'I guess they didn't believe me, so I showed them and I guess they had second thoughts,' she said. I found one today, after a cold front came through, with a lot of rain. I also found one on 6-24-2018. A couple of years previously, I found a large group of them in late Fall, after they had all matured and dispersed their spores. Location: Ulen, MN. Ulen city park in the woods. would love to eat this thing but afraid! Obvious it is a puffball!